146. Definition. That part of the plant which originates with the plumule, tends upward in its growth and expands itself to the influence of the air and the light, is called the stem or ascending axis. 147. The general idea of the axis is the central substantial portion of the plant, bearing the appendages, viz., the root below and the leaf-organs above. Although not marked by gay coloring or fantastic forms, yet we regard the stem with a lively interest for its substantial value, its gracefulness and lofty proportions, its infinite gradation of form and texture from the tender speedwell crushed beneath the foot to the strong forest oak. 38. Procumbent stem - Chiogenes hispidula. 148. Direction of its growth. Although the first direction of the stem's growth is vertical in all plants, there are many in which this direction does not continue, but changes into the oblique or horizontal, either just above the surface of the ground, or just beneath it. If the stem continues to arise in the original direction, as it most commonly does, it is said to be erect. If it grow along the ground without rooting it is said to he procumbent, prostrate, trailing. If it recline upon the ground after having at the base arisen somewhat above it, it is decumbent. If it arise obliquely from a prostrate base, it is said to be ascending, and if it continue buried beneath the soil, it is subterranean. 39. Decumbent stem - Anagallis arvensis. 149. Subterranean stems may be readily distinguished from the roots by the natural and habitual presence of buds in the former, regularly arranged, while no buds (unless rarely adventitious) exist in the latter. 150. Stems are either simple or branched. The simple stem is produced by the unfolding of the primary bud (the plumule) in the direction of its point alone. As this bud is developed below into the lengthening stem, it is continually reproduced at its summit, and so is always borne at the termination of the stem. Hence the axis is always terminated by a bud. 151. The Branched Stem, which is by far the most common, is produced by the development of both terminal and axillary buds. The axis produces a bud in the axil of its every leaf, that is at a point just above the origin of the leaf-stalk. These buds remain inactive in the case of the simple stem, as the mullein, but more generally are developed into leafy subdivisions of the axis, and the stem thus becomes branched. 152. A Branch is, therefore, a division of the axis produced by the development of an axillary bud. This bud, also, ever renewed, is borne at the termination of the branch, so that axillary buds each in turn become terminal. The alternate, where but one branch arises from the node on different sides of the stem, as in the elm. The opposite, where two branches stand on opposite sides of the same node, as in the maple. Verticillate, where three or more branches, equidistant, encircle the stem at each node, as in the pine. 154. The angle of divergence in branches is also subject to definite rules more obvious in the earlier stages of growth. While the divergence is uniform in the same species, it varies to every degree of the circle in different species, greatly affecting the form of the tree. In general, without marking the exact degree, branches are said to be erect (Lombardy poplar), spreading or obliquely ascending (common), divaricate or at nearly a right angle (oak), deflexed (beech), and pendulous (weeping willow). 155. Certain kinds of branches are noted for their tendency to produce adventitious roots, and thus to become independent plants. Nurserymen avail themselves of this property in propagation, and name such branches cions, stolons, offsets, slips, layers, cuttings, and runners. 156. The Sucker is a branch issuing from some underground portion of the plant, leaf-bearing above and sending out roots from its own base, becoming finally a separate, independent plant. The rose and raspberry are thus multiplied. 40. a, Slip (gooseberry) taking root, b, Cutting (grape) taking root, c, Stolons or layers artificially arranged fur propagation. d, A mode of dwarfing (§ 140). e, Cions - process of grafting. f, A Sucker. 157. The Stolon or Layer is a branch issuing from some above-ground portion of the stem, and afterward declining to the ground takes root at or near its extremity, sends up new shoots, and becomes a new plant. The hobble-bush and black raspberry do this naturally, and gardeners imitate the process in many plants. 158. 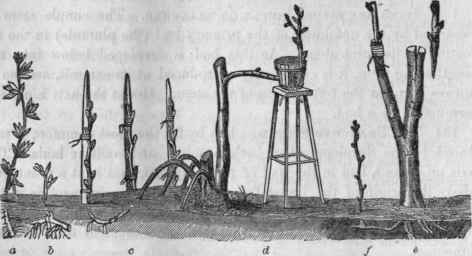 The Cion is any healthy twig or branchlet bearing one or more buds, used by the gardeners in the common process of grafting. Slips and cuttings are fragments of ordinary branches or stems consisting of young wood bearing one or more buds. These " strike" root when planted in the earth. So the grape-vine and hop. 159. The Offset is a term applied to short side-branches ending in a tuft (rosette) of leaves, and capable of taking root when separated from the parent plant, as in houseleek. 41, A strawberry plant (Fragaria vesca) sending out a runner. 160. The Runner is a prostrate, filiform branch issuing from certain short-stemmed herbs, extending itself along the surface of the ground, striking root at its end without being buried. Thence leaves arise and a new plant, which in turn sends out new runners; as in the strawberry.